Start off in Sussex, NB which is a picturesque and friendly town in our Southern section. Take Highway 1 East for about 15 km until you reach Exit 211. There, turn onto Route 114 and head for Fundy National Park on the Bay of Fundy. This 44 km stretch of relatively good road winds through forest and passes lovely rivers and creeks. The portion through the Park is just lovely, and the road improves, too. Watch the steep hill and sharp turns as you descend into the charming village of Alma. Stop there for the "best seafood chowder in the world" at the Harbour View Restaurant and General Store. Remain on 114 as you motor through Riverside-Albert and Hillsborough which are nice towns and fairly well-serviced. 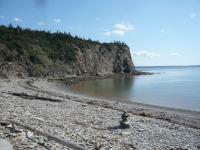 You will enjoy great views of the Bay of Fundy on the first leg of this journey. You can also go onto Route 915 for the first past of the trip; it is less well-maintained but a fun ride also. Not to be missed are the Hopewell Rocks just before Hopewell Cape. Pass through Riverview on your way to your end-point in Moncton where you will find everything that a city offers, including good motels, seafood and great nightlife. The Bay of Fundy is the star of this route, and you will see it many times as you make your way along from Alma to Hillsborough. You can also stop at the world-famous Hopewell Rocks and walk on the ocean floor at low tide. This is well worth the time spent. The NB countryside is pretty wild and undeveloped for the most part, and great tracts of forest, lakes and bush are your main traveling companions. Watch for deer, moose and bear along most roads. In Alma, peregrine falcons are sometime seen preying on seabirds. Bald eagles also nest along the Bay so be watchful. Overall, this road is in fair shape, but like many roads in NB, it needs work in a number of places. It is predominantly hilly and has some very sharp curves -and a steep hill- in Alma. There are a lot of frost heaves on this road, but that is just the way of it in NB; watch for them. Traffic is not too bad except in high tourist season, and there are adequate passing opportunities along the way. The Harbour View Restaurant (there are others in Alma, but not as good) has the aforementioned "best chowder" but there are many others along the way, especially closer to the tourist attractions. Both Sussex and Moncton have good accommodations but there are also a few decent places along the route. Let your experience be your guide. on February 14, 2012 1 out of 1 members found this review useful. Drove up from Boston to this area about 3 years ago. A group of about 9 of us rode our way up the US coast and into Canada. We loved every minute of the drive up there but we took our time a little too much and didn't have enough time to explore Nova Scotia and have regretted it ever since. Suffice it to say, if you are planning on doing some riding in Nova Scotia you really should plan on at least 3 days ... but 5 is ideal and will be what I'll do next time ... hopefully this August if I can get all the guys to line up their vacation time and the good Lord is willing!!! on May 23, 2012 0 out of 0 members found this review useful. Yep - this is a great ride but to tell you the truth, IMHO Cabot Trail blows it away!!! No offense XABXCO. on December 6, 2011 0 out of 0 members found this review useful. Sadly I missed the Hopewell Rocks, but I'd like to add that there is a covered bridge near Germantown worth a stop to view, and Cape Enrage was a scenic highlight for my day trip there. on December 3, 2011 0 out of 0 members found this review useful. A couple of guys from my office and I flew into Montreal and rented some bikes. We had about 2 days of time to ride and made the most of it traveling through parts of Quebec. We debated if we should head over to New Brunswick/Nova Scotia as some of the guys wanted to head down to the great lakes area and do some coastal riding from the Canadian side. I'm glad we did decide to head east ... simply put, this was some of the best riding I've ever done!!! We checked out this route - "Great Day's Run" - and it was a 5-star ride in my book! I especially liked the sections with undeveloped/virgin forest on one side and coastal bliss on the other. HIGHLY recommended ride!! Cabot trail was even more impressive too ... that one you CAN'T MISS ... we'll be coming back some day with a bigger group.